The cut of a diamond determines it's brilliance and how much light is returned out of the top of the diamond. A diamond's cut is crucial to the stone's final beauty and value, essentially determining how the diamond sparkles. Of all the 4C's, cut it is the most complex and technically difficult to analyze. 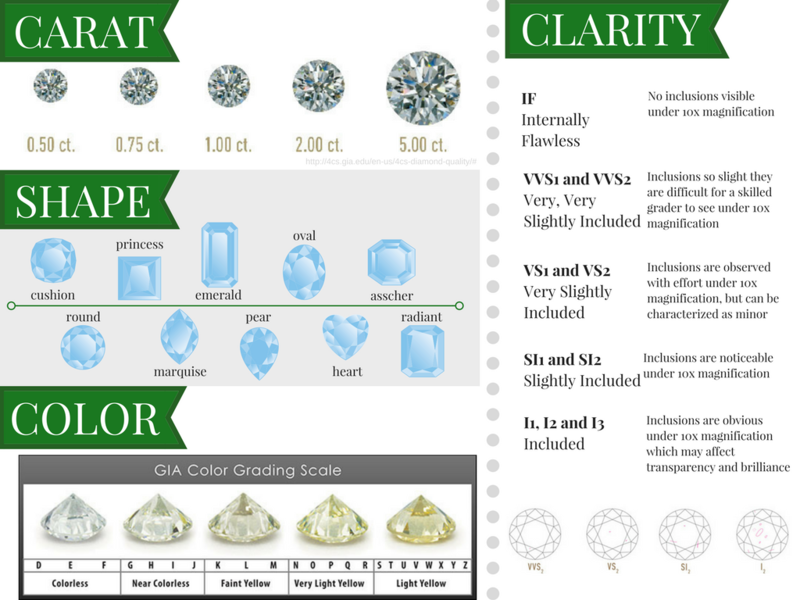 The clarity grade is defined by the type and size of natural occurring inclusions found within a diamond. Many of these inclusions are microscopic, and do not affect a diamond's beauty in any discernible way. The most familiar of the 4 C's, the carat weight is the actual weight or size of a diamond. Each carat can be subdivided into 100 'points.' This allows very precise measurements to the hundredth decimal place. All else being equal, diamond price increases with diamond carat weight, because larger diamonds are more rare and more desirable. But two diamonds of equal carat weight can have very different values (and prices) depending on three other factors of the diamond 4C's. It's important to remember that a diamond's value is determined using all of the 4C's, not just carat weight. © Copyright 2016 - Libutti eRetail LLC.